Jenny is an ACSM Certified Personal Trainer. 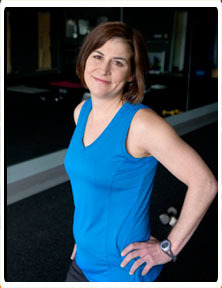 She enjoys working with clients of all ages and abilities, as well as leading a variety of fitness classes. She has always had a love of physical activity; so much that she lived in Colorado to enjoy all the mountains had to offer (skiing, mountain biking, hiking, etc.). She is an avid runner who has participated in several half and full marathons. Jenny earned a Bachelors of Science Degree in Civil Engineering from Purdue University. After working in the corporate world for over 15 years, she decided to pursue her true passion of helping others enjoy the many benefits of physical fitness. She understands the challenges of getting and staying in shape with the demands of a busy lifestyle and is dedicated to encouraging and motivating her clients. One thing she learned from her mentor “exercise is not something you have to do; it’s something you get to do”. It is truly a gift to yourself and your loved ones.